This is about a year-old news, and not very surprising, but still quite valuable. 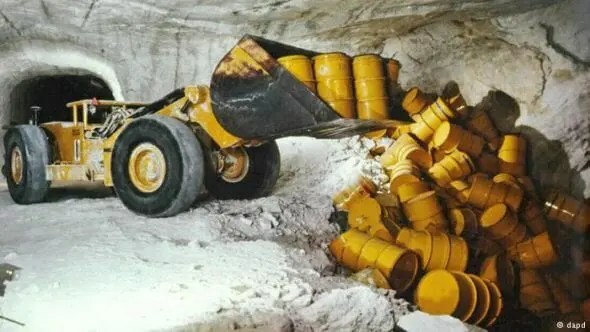 How South Australians dumped a nuclear dump is an article describing how the attempt to build a nuclear dump in SA was stopped, in a large part by its rejection by a citizen’s jury. This citizen jury and its aftermath were covered on Equality-by-Lot at the time (end of 2016). The article links to a piece by a member of the jury, who paints a picture of a rather blunt attempt to control the selection of witnesses against the pre-published protocol, and then to suppress any objections about this. I was a member of the Citizen’s Jury and it was clear from the outset that they had one answer in mind – proceed with the proposal. They took every opportunity to move the jury towards that predetermined outcome. But the more they pushed, the more the jury became suspicious. They were dismissive and disrespectful of ordinary South Australians at every turn. I learnt a great deal about the nuclear fuel cycle, but I also saw first hand the lengths those in favour of nuclear were prepared to go to win. It was not pretty and it has left me extremely distrustful of the nuclear industry and in awe of the power of local democracy. The idea of Citizens’ Juries would seem, superficially, attractive. But bias is inevitable if the government establishing and funding the Jury process is strongly promoting (or opposing) the issue under question. In the case of the Jury investigating the nuclear waste plan, it backfired quite spectacularly on the government. Citizen Juries will be few and far between for the foreseeable future in Australia. A key lesson for political and corporate elites is that they shouldn’t let any semblance of democracy intrude on their plans. Looking at the “Our Work” page on the newDemocracy website, it seems that the author’s prediction that Australia will see a dramatic decline in the use of citizen juries in the wake of the Jury on Nuclear Waste decision may have been quite accurate. While there are 5 projects listed for 2016, there is only one project listed for 2017 (and one that was probably initiated before the November 2016 decision). There is, however, one project for 2018 as well, so things may be picking up. Ha. Let’s apply a little critical thinking. It’s hard not to read this article and laugh at how people read the news and happily accept anything which reinforces what they want to be true. But surely we can push past that confirmation bias? I would invite you to consider a contrary view. This is based on ONE online comment. From a person writing under a pseudonym. With no example to back it up. In a highly partisan/activist online news outlet. “Dr Jim Green is the national nuclear campaigner with Friends of the Earth Australia and editor of the Nuclear Monitor newsletter. In a deliberation we ask people to consider multiple sources. Useful to do so in other instances as well though. Read this paper and come to your own conclusions. It would be hard to disagree that the testimonies reflect the points of view of those people making them and therefore may not reflect the points of view of others. It would be interesting to read additional testimonies. Do you know if there are additional testimonies available? Do you regularly collect exit testimonies from jury members? Thanks for the link to the document with lessons drawn. Having had a look, it seems this goes into fine details of the process. It would be problematic if those details make much of a difference because then whoever determines those details of the process gets to have a lot of influence over the outcome. Regarding the possibility of using a jury to deal with the section 44 issue – that would certainly be an interesting development and I am looking forward to see how that turns out. It is an interesting (but atypical) case where the elected got themselves into a problem which they need popular support to resolve. Finally, I wonder if you considered the possibility of complementing the approach you have been using so far – setting up citizen juries in response to government requests – with a government-independent approach, where juries are set up to examine issues they see as important, so they get to set the agenda and are not confined to a reactive role. What do you think? >Bias is inevitable if the government establishing and funding the Jury process is strongly promoting (or opposing) the issue under question. 2. Advocacy rights for and against arrogated to the government and (say) Friends of the Earth. 3. Large (statistically representative) and quasi-mandatory citizen jury that deliberates in silence before casting a binding vote. Whilst the notion of a bunch of ordinary people choosing to deliberating together before arriving at an (ideally) consensual conclusion is attractive in theory, in practice the outcome will be attacked by the losing side as democratically invalid — it will be claimed that the government is trying to fix the outcome and/or that activists are overrepresented. Justice has to be seen to be done, hence the need for forensic and agonistic rhetorical norms (contentio rather than sermo) and televised proceedings showing the advocates playing to the crowd and trying their best to rubbish each other. That’s how it works in the law courts and there is no reason to believe that this is the wrong model for the “trial” of legislative proposals. Habermasians will hate it but the notion of deliberative democracy has always been oxymoronic. Question to Iain: Have you guys at ND considered going beyond (or already gone beyond) just a structured process of hearing out the pro and con sides? While its fundamental necessity is clearly agreed, I have doubts about its sufficiency. In other words: In the nuclear dump case, an alternative, advantageous process design could require a total sample comprised of one sociodemographically representative sample of the pro-side and one of the con-side, i.e. give half seats to each side. I’d predict this to mitigate the problem of uncontrolled bias after the self-selection phase, when a neutral starting point is just wishful thinking. In Austria, we had good experience with a somewhat similar model, the so-called “social partnership” model which worked quite ok for several decades. For example, an collective bargaining agreement on yearly pay rises is problematic with a pure statistical sample, as there are more employees than employers. A majority “agreement” by just by the employee component of the sample would hide disagreement of the employers. However if the room is half full of employers and half full of employee representatives, you can control for this issue. Obviously, as sortitionists we’d work with random samples, rather than the elected representatives which ran the “social partnership” model (tarnishing the process with their own career issues). Hubertus >An alternative, advantageous process design could require a total sample comprised of one sociodemographically representative sample of the pro-side and one of the con-side, i.e. give half seats to each side. My understanding is that a jury made up of people who had already made their minds up in advance would be least likely to listen to the evidence. That’s why it’s important to separate the advocacy role (in which the confirmation bias is a valuable rhetorical asset) from the judgment role. The whole point of a citizen jury is that it is a microcosm of the target population, the majority of which who will have no preconceived views on the topic at hand (other than casual prejudices). Trial jurors are instructed to bracket out anything they have learned prior to the evidential exchange and the same principle should apply to a jury with a legislative function. Thanks Keith, but my question was directed at Iain. 1. the original baseline information document came from a Royal Commission headed by a former Governor, while the govt’s consultation agency was chaired by a former judge. The Royal Commission was campaigned against and attacked by protesters from Day 0. That’s what protesters do. Its why we were retained to design a highly substantive role for everyday people in the community. 2. we had a stakeholder reference group (checking for bias, able to nominate some speakers, contributing submissions) including the span of active interests from the Conservation Council to mining groups. No bias comment – not one – emerged from this group. 3. We thought the issue was so large that we would get close to “quasi mandatory”. The group itself was representative and started largely open to listening to a diversity of viewpoints. I think the sampling actually worked well – its not the origin of the issues. The short summary is that the initial jury of 54 ran flawlessly. The second jury of 350 did not – and we’ve published the short Research Note referenced below to explain what we will do differently for the next large scale project (basically ensure more happens independently in small groups before they come together as a large group). The second idea to split discursively (a pro side and con side) would be labelled as a stack and a manipulation. I understand the theoretical appeal, but I can’t see a real world application for it. Whoever advanced that would get smashed in the media. Representative means one thing to people (“it roughly matches society”) and woe betide the tinkerers on that front. My overall message is that people need to relax. Does everyone realise that activist interests (on any issue, on all sides) will shout more than they listen, and invent complaints in order to win their argument by any means available? Do others see that there aren’t right and wrong answers in public decisions, and a deliberation is not geared toward delivering a favourable answer? We let a representative group of citizens have a genuine, informed, deep conversation on a complex issue and for the wider community to follow along. This is a far more information-rich exercise than would otherwise have occurred. Critically, those in elected office see that the conversation was possible to have (336 still there at the end of 6 days), and that as an organisation we have transparently shared the operational limitations and changes we’ll make as a result. Iain, that’s fascinating. I’m not surprised if the activists objected if the the role of the judiciary was limited to the production of the baseline information document (this would be akin to a trial jury being informed by the prosecution alone). We need to follow the trial model much more literally — the role of the judiciary should be to oversee the dogfight between the opposing advocates (government and Friends of the Earth), with the jury deciding the outcome. The principal casualty will be deliberative norms as the advocates will lie, dissemble and misinform (that’s what advocates do), but then the other side will expose this in cross-examination. Why do you argue that the problem could be resolved by more small-group deliberations? It also strikes me as obvious that anything short of quasi-mandatory participation will be open to undue influence from activists (or at least those with strong views on the topic), that’s why I’m so opposed to Terry’s multi-body sortition model. >Do others see that there aren’t right and wrong answers in public decisions, and a deliberation is not geared toward delivering a favourable answer? That’s certainly true in the epistemic sense, but I think the best we can hope for is a decision that would reflect what everyone (or at least the majority of citizens) would think under good conditions. That will require an adversarial public exchange rather than a deep conversation, however repugnant that may be to deliberative democrats. The small group recommendation links to the quasi-mandatory point: the former is a fix for the absence of the latter. In short: we get mild skews to those with an active interest – the vast majority of attendees simply like the idea of being “politician for a day” (not literally, but I hope it conveys the idea) and connect with the idea of democratic reform. They come out of curiosity and hope. This is diluted by those who simply come for the money – and we use the variable of whether people own or rent their house as a surrogate indicator of income and education. That works well in securing a highly varied and representative group, but as you identify, anything short of compulsion leaves you with mild skews. In a small group (30-45), the one or two people with highly active interests (and correspondingly limited capacity to move positions) find they need to moderate their behaviour to the spirit of inquiry (rather than belligerent protest) in the group. Group size counterbalances the slight skew. However, in a group of 350 these individuals found 10-12 kindred spirits and deliberately behaved badly – you’ll see in the Research Note we detailed how they cornered people and insisted they put red dots on their name badge as a symbol to notify others they would vote “no” to any proposal. It was bullying, and we were too slow to pick up on it. They impaired people freely inquiring and discussing. It is intellectually weak and dishonest, and passionate active interests will resort to anything so we simply need to adapt and design for that. Done differently, we would leave the groups at the 30-40 size for 4 days and let them independently explore a topic in a format we now works for getting people to consider a breadth of sources. THEN we would bring them together with the small-groups norms of behaviour already established. We have a couple of large projects under discussion and we plan to apply this to test the hypothesis laid out. Thanks for the clarification Iain, but surely it would be more effective to do away with any sort of communication between participants? In a trial jury deliberation is necessary as unanimity is the goal, but this is not the case with a legislative jury, where the goal is purely a majoritarian one. In an email exchange I had with Jim Fishkin he insisted that the small groups were essential, but he never explained why and I concluded this was just a concession to his Habermasian critics. If, as he claims, deliberation is all about the weighing of options why can’t this be purely silent deliberation within? In their study of the Bloomfield Track citizen jury Goodin and Niemeyer concluded that most citizens made their mind up at the information stage, and that active deliberation didn’t make much difference. Has anyone tried following the procedure of the 4th century nomothetai more literally? Goodin, R. E., & Niemeyer, S. J. (2003). When does deliberation begin? Internal reflection versus public discussion in deliberative democracy. Political Studies, 51(4), 627-649. I think there is practical benefit to having people listen to one another and having some of their assumptions challenged. In an individual deliberation you can sit mute and believe the world is flat and vote accordingly – a worldview stops some people needing to weigh anything. In a purely electoral environment those running for office will promise to make it even flatter. If the public sector does things suggesting a round earth you won’t be swayed – if anything you will harden in your view and get more selective in your reading (Flat Earth Monthly?). But in an environment with everyday people like you people will ask you to support your position – and the fact that the source is someone real with a similar life experience has an effect. Years ago we did a council project on an environmental topic: early on we saw a group of (older) blokes find agreement around the table that a big machine was the answer. At the next table was an all-female group who found agreement education was the primary answer. The facilitator called out how we all have default ways we approach solving problems, and the next series of exercises mixed the tables. They benefit by listening to one another and having an exercise to work out what they can agree on. That common ground position is highly valued by those in elected office (my experience in Australia anyway). Not perfect, but that’s my core rationale for shying away from individualised deliberation. We still discuss this with governments (mainly when they have limited time) but its not something I’m itching to run a major project on. Iain, I understand where this is coming from. However, despite expressing a common belief, it reflects a highly problematic old theory, a mistaken prejudice about wise group decisions. It is true that for certain questions, statistical averaging will cancel out noisy error and leave us with the signal. On the other hand, there is a growing body of evidence that this constellation is more often an exception rather than the norm. In these more frequent constellations, statistical averaging of even perfect socio-demographic sampling will yield spectacularly wrong answers. The beauty of groups deliberating is that – if done right – it will give rise the the still little understood phenomenon of “collective intelligence”, a mode of meta-thinking which can produce consistently and replicably smarter decisions than each single of us, vastly outperforming a “dumb” statistical average of single opinions. The scientific principles at work behind this mode are “Bayesian” in nature, not traditional frequentist. Sampling for Bayesian processes is quite different to the one, and the term “split discursively” is positively one one to be considered very seriously and with an open mind. To pursue this discussion in a productive way, I object to what I read above, that “there are no right or wrong decisions”. This is a step on a dangerous path, a slippery slope which may lead people to rejecting the falsifiability criterion for prescriptive social decisions. A solid scientific approach (as opposed to religious belief and metaphysics) requires a definition of right and wrong decisions. We define as “right” decisions those where the chosen means achieve in fact an objectively defined future outcome predicted at the outset to be achieved, while “wrong” decisions fail to do so, producing undesired results. Iain, I can understand that a like-minded group are likely to reinforce their own prejudices, particularly if there is a problem-solving remit. But if it’s a simple binary choice (build or don’t build?) then what is the added value of face-to-face deliberation? If someone is going to change their mind on an issue where they don’t have any lived experience to contribute, then they are more likely to be swayed by someone who knows what they are talking about. If Friends of the Earth had provided the advocacy against the dump and fair play was ensured by a judge then how could they object? (The government could hardly object if they were providing the advocacy for the dump.) I would hazard a guess that if you did an experiment with a number of parallel CJs using this model they would all come to the same conclusion (within a given margin of error), so the “verdict” would reflect what everyone would think under good conditions. PS do you take issue with Goodin and Niemeyer’s perspective on the Bloomfield Track? Keith and Iain, as I think you both know, not all trial juries have to be unanimous to reach a verdict. For example, Scottish trial juries have for centuries decided by majority vote. The goal of a trial jury is epistemic (to decide on the plausibility of the facts in the case) and the ideal is unanimity, whereas the goal of a legislative jury is to represent the informed preferences of the target population. I participated in a trial jury a couple of years ago and we couldn’t agree on the facts so the judge agreed to accept a 10/2 verdict. In the end it was 9/3 so the judge dismissed the jury and ordered a retrial, but 75% would be considered a highly-desirable supermajority in a legislative “trial”. The reason for jury-room debate is the ideal of unanimity and this is completely unnecessary in the legislative case — the jury would be far more representative of the target population if it determined the outcome of the exchange between advocates by silent deliberation followed by secret voting, as this minimises the risk of the jury being unduly influenced by persuasive and high-status members (as was the case in the trial jury I participated in). In the criminal case this was a good thing as it prevented the wrongful conviction of an innocent person (IMO), but there was nothing remotely democratic about it. Keith, you seem to agree in your comment (the one immediately above) that deliberation in trial juries is a good thing. In the case of the jury you were in you believe it helped to get the right result. I think getting the “right result” is also important for jury legislatures and for juries choosing public officials. It is not just a matter of reflecting informed public opinion with all the jurors being equally influential in determining the outcome. I also think it not a bad thing if jury legislatures and selection juries get closer to a unanimous result through deliberation, but believe they should decide by majority vote. If there are in regard to juries trade-offs between political equality and getting as informed a decision as possible, I think (as I’ve said before) the best approach is to let a jury decide what trade-off will be made, including whether there will be deliberation or not, and if so what the procedures and arrangements for such deliberation will be. In order to help such a jury make an informed decision, they can be advised by a standing commission chosen by jury to investigate possible procedures to discern what is best and to identify trade-offs between different objectives (such as the objectives of having an informed decision and political equality). The political inequality problem in popular election and referenda is of course far greater than for juries. In popular vote, status (such as being a celebrity for example), persuasive individuals, skilled liars, ads, the role of money, political parties, media and people’s media choices, under-representation of younger citizen among those who vote, and other things, influence outcomes and voter perceptions all the time. It is not at all the case that each citizen has an equal influence on the outcome (as of course we all know). What we need to do is outline a much better alternative to popular vote, not meet utopian standards. Simon:> What we need to do is outline a much better alternative to popular vote, not meet utopian standards. Yes, I agree. But anyone who thinks that this issue can be resolved purely by recourse to juries (and juries appointing juries) should read Lucy Parry’s article: https://equalitybylot.wordpress.com/2018/02/13/when-is-a-democratic-innovation-not-a-democratic-innovation-the-populist-challenge-in-australia/ Epistemic criteria (getting the “right” result) are all very fine and dandy, but in a demotic age representativity is the principal constraint. This has nothing to do with utopianism and everything to do with perceived legitimacy. We need to get real. Keith, I’ve so far only read the post you link to (not the whole article in Participedia). I don’t deny that the line of anti-jury propaganda indicated is potentially a real problem that needs to be answered. In lawmaking we either give the final say to juries, or to referenda, or leave it to politicians. So yes, we do have to make the case that juries are the only good and democratic option of the three. For people who want ordinary people to rule rather than elites, jury legislatures are the only good option. The other two approaches both systematically disenfranchise and marginalize the people, and heavily skew the playing field in favour of elites. What we need to do in the context of populism is show the truth, which is that juries are the populist option, and that referenda and popular election are elitist and oligarchic. We of course can only support populism of a democratic kind, not anti-democratic populism based on for example defining “the people” as white Christians. I don’t think whether juries deliberate or not is key to winning this argument, and see no other informed and democratic way to decide the debate on deliberation other than by letting juries decide it. The public do not object to trial juries on the grounds that they think trials should be decided by referenda in order to reflect uninformed public opinion, rather than the more informed and evidence-based opinion of the jurors. Similarly, it is sensible to prefer a minipublic decision on or example tax law or the minimum wage, to the poorly informed decision and skewed playing field of a referendum. I also don’t especially support a complete ban on referenda. I do think that whether a proposed law goes to a referendum vote or jury legislature is something that needs to be decided by jury. If you read the article (it’s very short) you would see that the author (a Participedia research assistant) appears to be a passionate advocate for minipublics who is concerned about the danger from populism. I’m not aware of any populist politicians, tabloid newspapers etc who are campaigning against sortition or legislative juries and that this “propaganda” has had an influence on the views of Joe Blow. The problem is simply one of rational ignorance and it’s a mistake to think that this is exclusive to elections and referenda. The definition of rational ignorance is “refraining from acquiring knowledge when the cost of educating oneself on an issue exceeds the potential benefit that the knowledge would provide”. This would be just as much a problem in a world of minipublics from the perspective of the vast majority of citizens who are not included and this is the topic of this thoughtful article. The only way that I can see of ensuring there is no disconnect between participants and non-participants is to specify that the deliberation is public and adversarial (as with a court-room trial) and this would involve the jettisoning of most of the shibboleths of deliberative “democracy”. Joe Blow generally accepts the verdict of the trial procedure as an impartial one, so this is the model we should follow for the trial of legislative proposals.